Carbon dioxide is one of the main culprits for greenhouse gases and the reduction of emissions of this toxic substance has become the topic of the agenda. Greenhouse gases are released into the atmosphere by burning fossil fuels. Accelerated industrial activity in many developed and developing countries has dramatically increased the levels of these emissions in the air. Mass deforestation has also cut the globe’s ability to absorb these gases. The dilemma is how to find ways that permit the economic growth without jeopardising the environment. Canada along with other 37 countries has ratified the 1997 Kyoto protocol according to which the emissions of greenhouse gases must be reduced significantly by year 2012. It has adopted the policy of private-enterprise solutions to the global warming problem. As the date of reducing significantly the emissions of greenhouse gases is approaching, many wonder whether governments would ever consider the adoption of some measures to reduce the accelerated deterioration of the atmosphere. It is feared that the uncontrolled industrial activity may lead to a situation where further economic development would be impossible. Greenhouse gases believe to cause warming of the earth’s climate, leading to erratic whether, melting polar caps and drought in already warm regions. The ecological equilibrium is in jeopardy. From a policy perspective the radical plan hammered out by politicians in Kyoto is the first concrete initiative to fix targets for a significant reduction of greenhouse gases. Although the timetable set for gases emissions reductions is considered by some too long and by others too short, the fact of the matter is that the countries which ratified the Kyoto protocol have not taken, as yet, any concrete measures to the application of the agreement. Plausible questions arise as to the seriousness of politicians and policy makers to tackle this problem. Canada is a case in point. It has pledged, under the Kyoto agreement, to cut greenhouse gas emissions by 6 per cent from 1990 levels by 2012. It has opted to use a market where every ton of carbon dioxide that is removed from the atmosphere or prevented from being emitted is bought and sold on an exchange like the one that already exists in the U.S. for sulphur dioxide emissions – a market that is now worth an estimated $500-million (U.S.) in trade a year. Under such a regime overpolluters could offset their reduction obligations with credits. Demand and supply for credits would provide the appropriate incentives for reducing emissions. Actually, prices, as determined in the auction exchange market, would provide the appropriate signals for emissions reduction. A strong demand for the credits would push up the price of the units and create a powerful incentive for others to create more credits by devising innovative means of cutting emissions. Such an environmental regulation provides incentives for technological change and better environment. Section II examines in more detail the greenhouse gas emissions problem and the measures developed to gauge sustainability. Section III analyses the economic implications of global warming and presents a review of the literature. Section IV examines the impact of the Kyoto protocol on both industrialised and developing countries and compares its effects under international tradable permits and independent abatement schemes. Economic arguments such as first-mover advantage and incentives for technological change under environmental regulation are also examined. The last section concludes and offers policy recommendations. The greenhouse emissions problem is becoming increasingly a serious one and as such should not be taken in isolation in the decision-making process. Its impact is so pervasive and its ramifications so broad, on both our economic and social lives, that it deserves a serious consideration by all stakeholders. The latter become increasingly aware and concerned about governments’ slow reaction, and in some cases complete inaction, in adopting appropriate environmental policies. A policy aiming at a real reduction of gas emissions must be conceived in a way that all decision-makers are considered and integrated in the policy development. Every policy creates its own winners and losers. Reactions to the application of a policy, positive or negative, become greater should some groups are excluded from the decision-making process. Sustainable development takes into account both human and natural factors. There is a dynamic interaction between them and a detailed knowledge of how human-ecosystem relationship works has contributed to a long and ongoing debate about the definition of sustainable development. MacNeill et al. (1991, 26-28) focus more on the decision-making process to define sustainable development. "The environment and the economy must be integrated in our major institutions of decision making: Government, industry, and the home. This is perhaps the most important condition for sustainable development." The advantage of this definition is that it stresses the importance of integration of all decision makers. It recognises the importance of stakes in the elaboration of policies and the potentials of failure when some of the major actors are outside the main decision taking process. The debate on the definition of sustainable development has created the term of ecological capital. The latter is composed of a base of natural resources (both renewable and non-renewable), bio-diversity and the absorptive capacity of the ecosystem for wastes. For this capital to stay intact for both future and current generations there is need for the latter to live exclusively on the "interest" of this ecological capital. Progress and sustainable development are only possible if there is no a depletion of ecological capital through an irrational use of this scarce resource. Strong sustainability requires that all resource levels be maintained and not drawn down while weak sustainability recognises the substitutability of some resources (solar energy and natural gas for example) and allows such a substitution as long as the essential capacity of the ecosystem to support life is not damaged. The concept of sustainable development can be better substantiated by developing quantifiable measures of sustainability which make the concept more operational. In that sense, policy makers and the public in general, are getting better equipped in defining targets and objectives of sustainable development. Furthermore, they can better assess progress made in meeting the goals set. Measurement can also help the quantification and empirical examination of various environmental policies pursued and corrections to be made, should it be necessary. Quantifiable measures of sustainability make interregional and international comparisons over time much easier. Furthermore, performance evaluation in achieving goals and pre-set objectives is better attained with the development of such measures. The latter may also help to translate the concepts of sustainability to precise actions to be taken (explanatory tool). Sustainability measures can help to plan (planning tool) the actions to be taken and policy alternatives to be chosen. Lastly the measurement of sustainability as a performance assessment tool helps decision makers and politicians to decide the success of their environmental policies in curtailing gas emissions. Despite the importance of measurement there are no generally accepted rules and methodologies that allow the measurement of sustainability across regions and sectors, locally or internationally. The sheer number of indices and the lack of standardisation makes interregional or international comparisons, at best, difficult. The same degree of difficulty is encountered even within the same jurisdiction given that different national agencies use a different methodology in measuring sustainability. Canada has, at least, two measures of sustainability, one developed by Environment Canada (EC) and the other by the National Round Table on the Environment and the Economy (NRTEE). The first one uses a set of national indicators developed from readily available data primary from national surveys and monitoring programs. The second (the NRTEE measure) takes a more holistic approach. It emphasises linkages and interactions of various constituent parts which are referred to the whole system and then integrated to provide a full description of the system. Nevertheless, a single national indicator is not adequate for Canada given its ecological diversity. The division of Canada in ecozones (15 terrestrials and 5 marine ecozones) provides a better classification for indicators in a diverse setting. Sustainability indexes have also been developed by Canadian provinces, Canadian private firms and/or Public Utilities (Northern Networks, Ontario Hydro, etc) . Each of them has its own objectives and uses a methodology specific to its needs. None of these indexes is a perfect indicator of sustainability and all of them have advantages and disadvantages. The main disadvantage shared by every index is its own generality. It is a "wholesale" i.e. an aggregate index that gives some indication to the direction taken by a nation or a region as far as the use of natural capital is concerned. These indices lack the power to be used on a micro basis where every agent can understand properly and participate accordingly to the decision making process so that the earth’s natural capital is preserved. The objective of this research is to identify methods to be applied efficiently to reduce and/or even curtail dioxide emissions. We judge that aggregate sustainability measures are less relevant for our purposes. We concentrate, therefore, more on micro indices. Be sure the efforts employed to reduce the emissions on a micro basis will be reflected on the macro or aggregate measures. Nevertheless, judging a micro policy by using an aggregate approach underestimates the effectiveness of the measures used. Fr this reason, in the analysis that follows and in the calculations made, the concept of weak sustainability and those of micro measures are used to evaluate the Kyoto accord. A lot of studies and research have been realised by many independent economists and international organisations to predict and evaluate the possible impacts arising from the uncontrolled emissions of gases in the atmosphere. According to the U.S. Department of Energy estimates, the CO2 emissions generated from the consumption of fossil fuels in the most industrialised countries will increase by approximately 30%, from 1990 to 2010 (Figure 1). Brown (1999) has estimated that developing countries would comply with the Kyoto accord only if they get a quota of consumption of approximately 12% of the amount of fossil fuels of the industrialised countries. Compliance with the accord by both industrialised and developing countries would result in a combined slowdown of growth of global CO2 emissions from the projected 45% to 30% between 1990 and 2010. However, such dramatic reductions in pollution are not without costs. It is increasingly argued that compliance with the Kyoto accord means that the industrialised countries would incur a significantly rising costs. The latter would have negative repercussions on economic growth and prosperity to both industrialised and developing countries. By contrast, the benefits from complying with the accord are, at best, uncertain. No wonder why many countries are shy of undertaking appropriate measures to reduce pollutants. A quantification of benefits and costs is thus appropriate in helping policy makers and the public in general to better understand the stakes at the heart of the Kyoto protocol. Economic theory provides various approaches to evaluating investment projects. Regulation used to be the most favoured one. It is an indirect way because it aims at controlling the negative effects by imposing regulations not on individual firms or agents but on the industry as a whole. Firms that do not comply with such regulations are punished. Researchers have cast some doubt about the effectiveness of regulations and it has been estimated that costs of compliance are quite high. A more direct way to reduce pollutants is, of course, the imposition of a tax on defaulters. Although this approach involves costs too, it is believed that the taxation method is superior to regulation. Furthermore, the results from setting an appropriate tax on carbon-based fuels are better monitored and easier to quantify. Pigouvian taxes have long been used as a means to control pollution problems. Pigouvian taxes, although more direct than regulation, have their own disadvantages, the most notable one being the distortion effects on economic activity. Trade in emission rights is considered to be the most effective and the least costly solution to global warming problem as demonstrated below. Lately, many general and partial equilibrium models have been used to evaluate the effects of global warming. Cost-benefit analysis quantifies both the micro and macroeconomic effects of gas emissions and provides more detailed information as to the appropriateness of signatory countries to abide to the Kyoto protocol. According to this approach the benefits of reducing CO2 emissions are reflected in the quality of the environment which is getting better with the efforts of reducing the harm caused by pollutants. The costs are easy to quantify as well. They are the foregone opportunities due to the current reduction in the use of fossil fuels. A number of authors (Fankhauser, 1994; Nordhaus, 1991a, 1991b, 1992, 1993) have attempted to evaluate the economic costs associated with the potential environmental damage caused by CO2 emissions. They count the benefits in terms of barrels of oil equivalent, that is to say the CO2 emissions resulting from the consumption of a barrel of oil. Calculated in 1995 dollars, the marginal benefit to be realised by 2010 from a reduction of CO2 emissions vary between $0.00 and $33.75 per barrel of oil equivalent. As far as the world wide total benefits from reducing CO2 emissions are concerned , they range from $0.92 to $6.61 per barrel of oil equivalent with a mean value of $2.86. These meagre benefits have led some to call into question the appropriateness of undertaking such environment-friendly programs, like the Kyoto accord. This conclusion gets more weight in relative rather than absolute terms, i.e., by comparing benefits to costs. Several authors (Brown and Huntington, 1998; Felder and Rutherford, 1993) have used simulation models and the estimates of the U.S. Department of Energy (DOE) on oil prices, quantities and elasticities of demand in order to calculate marginal cost curves for U.S. abatement of CO2 emissions . 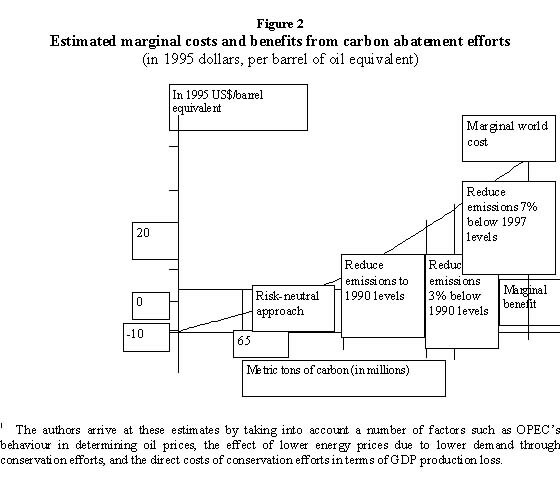 Marginal costs estimates at various levels of millions of metric tons of carbon abatement are calculated and compared to marginal benefits derived from the abatement efforts (figure 2). Supposing a risk-neutral approach, the determination of an optimal level of CO2 abatement is determined at the level where the marginal benefit ($2.86) equals the marginal costs of abatement ($6.61). This level equals 65 metric tons of carbon abatement, far below the targets (478 metric tons) implied by the Kyoto accord. Should countries abide to this target, the marginal cost per barrel equivalent is as high as $25.00. But even at more modest levels of carbon abatement, the marginal costs are quite high compared to marginal benefits. In the case of the U.S., the proposal to reduce U.S. emissions to 1990 levels by 2010 implies 384 metric tons of carbon abatement at a marginal cost of more than $16.00 per barrel equivalent. Table 1 summarises these findings and figure 2 presents graphically the estimates of marginal costs and benefits from carbon abatement efforts at various levels of millions of metric tons of carbon. Source: Various sources; compilation by the author. Abiding to the accord makes, nevertheless, some economic sense. Economic agents seek for insurance and they are willing to buy one whenever the benefits arising from the realisation of an unwanted event outweigh the costs (the premium) of the insurance. The Kyoto accord can thus been seen as an insurance in the sense that its costs are known with certainty while the benefits are unknown. The appropriateness to hold an insurance depends of course on the risk aversion of policy holders and the price of the insurance (in this case the costs of reducing the emissions). The Kyoto accord looks more like as if industrialised countries were looking to buy an insurance in the sense that the costs of reducing emissions of CO2 are known to them with certainty but the benefits are uncertain. Like any other insurance though, the problems of free-riding and moral hazard are widespread. A country’s decision to abide first to the accord depends on its risk aversion, on its capacity to pay the premium and the value of anticipated benefits. Knowing, however, that some countries (the greenest ones) will be willing to go ahead anyway with such an accord, others will tend to underestimate the potential benefits of reducing pollution and act as free riders. No wonder why the progress on ratifying the accord is slow. The free riding problem is compounded further when indirect costs of compliance are taken into account. The latter, such as regulation and rent-seeking activities increase substantially the costs of compliance. Once such hidden costs are incorporated, the costs of reducing U.S. CO2 emissions are more than $30 per barrel of oil equivalent. By comparing marginal benefits to costs of compliance, it becomes obvious the disinterest by many countries in ratifying the accord. The above mentioned costs of carbon abatement seem quite large and discouraging especially in the present context of globalisation and international competitiveness. Should only few countries go ahead with the protocol while others stay put, the effects of meeting targets would be unequally distributed between these two groups of countries. Non abiding countries, by avoiding the additional costs of pollution abatement, can get a competitive advantage at the expense of abiding countries. Low cost firms of the first group would penetrate foreign markets and pre-empt otherwise competitive firms of the second group of countries. Therefore, going ahead with the accord is not a Pareto improvement situation since one party’s welfare is increased at the expense of the other. An unequal distribution of befits results. Nevertheless, the above argument can be reversed. Some economists have formally demonstrated that firms abiding to the Kyoto accord could develop a competitive advantage compared to their rivals who are less environment-conscious. This is so because firms and countries alike utilise the least costly methods of reducing emissions first. Firms that move first into that direction get a cost advantage compared to late-comers. Given that the size of the emission abatement task gets larger and larger, the costs of abatement become higher and higher. The total emission abatement costs depend as well on the substituability of available technologies. If a country or a firm already uses a less emission intensive technology it has less possibilities to choose other technologies better than its current ones. Having exhausted almost all low costs abatement possibilities, further abatement becomes relatively more costly. In that case, emission penalties become higher in order to induce firms to alter production processes and consumers to change consumption patterns to reduce emissions. Independent abatement is more onerous compared to internationally traded emission permits. Table 2 shows these costs for selected Annex B (industrialised) countries under the two alternative schemes. The internationally traded emission permits allow some countries, especially the ones with low marginal costs of abatement, to expand their activities to meet the emission targets and reduce them even further in order to sell the excess of their emission quotas and realise additional gains. Trade and investment are the means by which the costs and benefits of abatement activities are shared between developed and developing countries. The size of effects is a function of various factors such as the extent of trade in fossil fuels and fossil fuel intensive commodities (iron, steel and other ferrous metals). Industrialised countries would experience an increase in production costs and then an increase in commodity prices because of their efforts to curtail emissions. Consumer prices and production costs would increase as well in developing countries through higher costs of imports. Some developing countries, the ones exporting more emission intensive goods (Brazil, India and China) would gain from trade as an increase in their export competitiveness. Other developing countries which are emission intensive exporters (Asian countries) would experience a reduction in their well being (measured by a decline in their GDP). This results from higher import costs and consumer prices despite the increase in export earnings. Other developing countries which are more fossil fuel intensive exporters (Africa and Middle East) would experience a reduction in their well being, as measured by a decline in their GDP and in their export earnings. Such an outcome is justified by the fact that developed countries would reduce their imports from developing countries of the fossil fuel in response to their commitment to reduce emissions. It is evident, therefore, that the effects of the Kyoto accord are not limited to the abiding to the accord countries but they have ramifications on non abiding countries through investment and trade. These effects are totally unequal and they depend on each group of countries’ initial endowment of environment-friendly technologies and/or its trade exposure. Given the international competitive context, the first-mover advantage argument could lead some to think that there will be a race among firms and countries to comply first with the Kyoto accord. But this argument ignores the uncertainties and the high costs of compliance. Furthermore, information is not perfect and economic theory suggests that in such circumstances there is a market failure with an outcome which is less than optimal. In the absence of any other concrete measures to be taken by the countries (especially the Annex B countries) no race to abide to the accord should be expected. Governments, by taking a firm position as far as their decision to abide to the accord is concerned, provide more information rendering the markets thereby more perfect. It is thus extremely important and urgent for Annex B countries to make explicit their intentions to abide to the accord. It has been demonstrated that costs of compliance are lower with emission permits compared to the system without such schemes (Kurosawa, A. and Yanagisawa, Y., 1999; Manne, A. and Richels, R., 1999). This is true for both developing and industrialised countries. In a dynamic global trade model which accounts for systematic differences in the energy efficiency production in both groups of countries, Bernstein et al. (1999) demonstrate that trading in emission rights provides the lowest cost path to Kyoto. Nevertheless, they fail to show whether non Annex B countries have incentives to participate. But when we compare independent abatement schemes and internationally tradable permits, it seems that the overall impact of emissions curtailment on developing countries’ well-being will be lower under the latter. The tradable permits is therefore a better instrument in achieving emission targets relative to other instruments. It manages to equilibrate the overall effects of emission targets between developed and developing countries resulting in a more equitable outcome. International trade in emission rights can help firms and countries to succeed better and faster in the international arena given that innovative and environment-friendly technologies are used in order to respect the constraints set by the Kyoto accord. Internationally competitive firms reap off the benefits that result from abiding to the carbon abatement schemes, incurring in that way additional costs, at least indirectly, to rival firms. If loss of competitiveness of late-comers are added to the above directly estimated costs, compliance with the Kyoto accord seems to be an extremely costly proposal. Nevertheless, costs are mitigated and substantially reduced when we take into account all the provisions of the Kyoto accord. Indeed, the accord makes room for a system of internationally tradable emission quotas, for joint implementation and for clean development mechanisms. Such schemes, if implemented, could reduce the costs of meeting abatement targets. And when the accord is viewed as a means of increasing international competitiveness, the industries (economies) which abide to the accord face a less onerous adaptation. According to some estimates (Abare, 1999, p.8), world wide costs of countries committed to abide to Kyoto accord reduce to a fifth when emission trading schemes are introduced compared to the situation without such schemes. Furthermore, the reduction of costs is even more dramatic when we consider emissions trading compared to independent abatement. 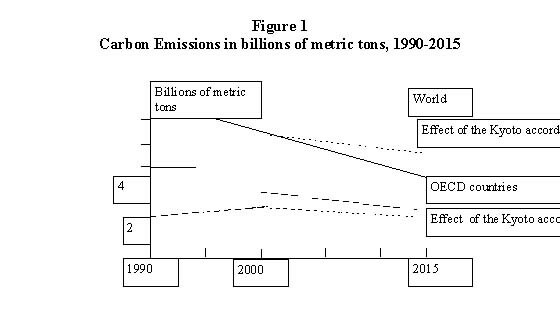 Under such a scheme, it is calculated that global emissions could be 0.4 billion tones lower at 2010 than they would have been without such a scheme (Abera, 199, p.7). International emissions trading is then a more effective means in reducing the costs of abatement because it funnels, through trading, the abatement efforts to countries with the lowest marginal costs of abatement. The Kyoto accord has set the bases for a cleaner environment and the participating countries are currently trying to develop the necessary means for attaining the targets established. The most favoured approach is the use of trading permits. This private-firm solution is debated by many as far as its efficiency is concerned. Economists, however, demonstrate the superiority of this approach compared to most direct ones such as taxes and direct penalties. Little progress has been done though world wide even in the use of this approach. The apparent difficulty lies in the uncertainty surrounding the real threat emanating from the presence of sulphur dioxide and the sheer size of costs associated with the reduction or the curtailment of the emissions of gases. Given that the costs are ten times higher than the estimated benefits little interest exists from private firms and governments to implement the necessary measures for cleaner environment. It is argued in this paper that the estimated costs and benefits, although valid in a strict economic sense, neglect some important facets that can make an important difference in the outcome. The benefits arising from the reduction of CO2 emissions are calculated as the environmental damages that are avoided by preventing rising concentrations of gases. Although costs are calculated in a more direct way the benefits are at best uncertain. Even the direct benefits are really difficult to calculate, never mind the indirect ones. Cleaner environment and better standards of living arising out of emissions curtailment are difficult to quantify accurately. Should such comprehensive calculations were possible we would have a more balanced picture of the true costs and benefits. The international trade in emission rights reduce the calculated costs without altering drastically the ecological capital. Weak sustainability is possible and it can be achieved by relying on the market mechanisms, such tradable pollution permits. In a ever increasing competitive environment firms have a particular interest and incentive to comply with the Kyoto accord first before their competitors do so. The competitive advantage thus gained makes them more efficient and financially stronger, not weaker. The very recent experience with an ever increasing number of firms seeking to strike deals in getting trading permits is an evidence in point. Such a market is worth more than $60 billion-a-year in the U.S. alone. If politicians agree on clear rules for international trading, the global market could in time reach a trillion dollars a year. Such a growth in the market of tradable permits is quite promising as far as weak sustainability is concerned. Governments should abide to concrete and permanent rules on trading of pollution permits so that polluters and non polluters find the way to trade their permits and reduce the pollution of the environment. By rendering markets more perfect (information becomes more symmetric) the quality of the environment in the future can only get better. Abare, Impacts of the Kyoto Protocol on Developing Countries, Canberra, March 2000. Abare, International trading in Greenhouse Gas Emissions, Canberra, 1998. Abare, Economic Impacts of the Kyoto Protocol: Accounting for the Three Major Greenhouse Gases, Canberra, 1999. Anonymous, "Hotting up", The Economist, October 30th 1999. Bernstein, P.M. et al. "Global impacts of the Kyoto Agreement: Results from the MS-MRT Model" Resource and Energy Economics, vol. 21, pp. 375-413, 1999. Brown S. P. A., "Global Warming: Some Economic Implications" Federal Reserve Bank of Dallas Economic Review, 4th Quarter, pp.13-21, 1998. Brown S. P. A. and K. Yücel "Energy Prices and State Economic Performance" Federal Reserve Bank of Dallas Economic Review, 2nd Quarter, pp.13-21, 1995. Brown S. P. A. and H. G. Huntington "LDC Cooperation and in World Oil Conservation" The Energy Journal, Special Issue, pp.310-28, 1994. Brown S. P. A. and H. G. Huntington "Some Implications of Increased Cooperation in World Oil Conservation" Federal Reserve Bank of Dallas Economic Review, 2nd Quarter, pp.2-9, 1998. Climate Action in the United States and China, Error! Bookmark not defined. Fankhauser, S., "The Social Costs of Greenhouse Emissions: An Expected Value Approach" The Energy Journal 15 (2):157-84, 1994. Felder, S. and T. F. Rutherford, "Unilateral CO2 Reductions and Carbon Leakage: The Consequences for International Trade in Oil and Basic Materials", Journal of Environmental economics and Management, 25 September, pp. 162-76, 1993. Ghanem, S., Lounnas, R. and Brennand, G. "The Impact of Emissions Trading on OPEC" OPEC Review: Energy Economics and Related Issues, pp. 79-111, June 1999. Gentzoglanis, A., Imperfect Markets and Tradable Pollution Permits Under Government Regulatory Control, CEREF Document, University of Sherbrooke, 1999. Gentzoglanis, A., Error! Bookmark not defined. Hertel, T. (ed. ), Global Trade Analysis: Modeling and Applications, Cambridge University Press, Massachussetts, 1997. Kurosawa, A. and Y. Yanagisawa, "Analysis of Carbon Emission Stabilization Targets and Adaptation by Integrated Assessment Model", in Error! Bookmark not defined. MacNeil et al. , Beyond Interdependence, New York: Oxford University Press, 1991. Manne, A, and Richels, R. "The Kyoto Protocol: A Cost-Effective Strategy for Meeting Environmental Objectives?" in Error! Bookmark not defined. Mendelsohn, R. and Neumann, J.E. (eds), The Impact of Climate Change on the United States Economy, Cambridge University press, New York, 1999. Nordhaus, W., "A Sketch of the Economics of the Greenhouse Effect", American Economic Review 81 (May, Papers and Proceedings): pp.920-37, 1991. Nordhaus, W., "Optimal Greenhouse Gas Reductions and Policy in the "DICE" Model", American Economic Review 81 (May, Papers and Proceedings): pp.313-17, 1993. Special issue, "Distributed Resources: Toward a New paradigm of the Electricity Business" The Energy Journal, February, 1998 Error! Bookmark not defined.